Egypt (AINA) -- Osama Araban, a Muslim man riding a Harley-Davidson motorcycle, went on a rampage last week in Egypt, killing 63-year old Coptic Christian Abdo George Younan, in the village of Bagour, before traveling onwards and stabbing with intention to kill two other Copts in two different villages, at least 10 km apart (AINA 9-18-2009). In the village of Behnay he repeatedly stabbed Coptic shoemaker Adib Boulos before being stopped by eyewitness Behman Saeed, after whom Osama Araban ran, leaving the victim behind. Adib suffered a broken scull and lung hemorrhage, and is still fighting for his life in intensive care unit at Shebin el-Kom Hospital. Osama Araban then traveled to the village of Mit Afif and stabbed his third victim, Sobhy Barsum, a blacksmith. He also stabbed his brother Hani Barsum in the neck -- only to be saved by a co-worker. Hani was also hospitalized. Osama Araban was arrested the following day. 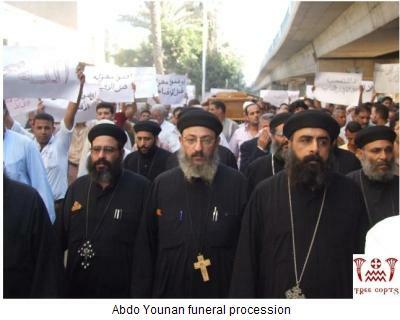 The funeral procession of Abdo Younan was attended by thousands of Copts, led by Metropolitan Archbishop Benjamin of Menoufia Diocese and seventeen clergymen. Hundreds of banners were held, showing the amount of anger and injustice felt by Copts. Anti State Security chants were heard during the procession, besides calling on President Mubarak and the government to save the Copts from the hands of the fundamentalist who are killing them. 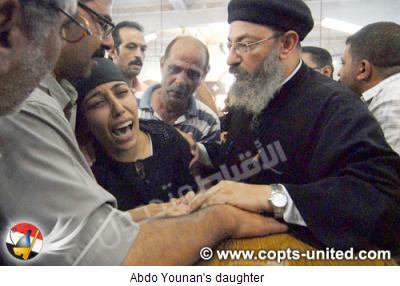 This incident which took place on September 16, 2009, has left Copts in Egypt shocked and angered, not only because attacks against Copts have been escalating, but because of the way the murder was committed. The details of the attacks, not told by the media, but exposed by Coptic lawyers and activists, reveal that 35-year old car painter Osama Araban not only stabbed Abdo nine times but also severed his head from his body -- an Islamic ritual beheading. He then meticulously washed his bayonet with the water hose the victim was using, before setting off on his motorcycle to the next two villages, looking for more Coptic victims. Egyptian State Security, which is in charge of drafting press releases and news related to Muslim attacks on Christians, decided from the start which route they wanted the incident to take, and tailor the news accordingly. In an attempt to influence public opinion for the forthcoming acquittal of the Muslim killer, the media reported that the reason for the killing was a "material dispute." Renowned attorney and activist Dr.Naguib Ghoraeel, head of Egyptian Union Human Rights Organization, issued a press release on September 17, calling the crime a massacre, and confirming that what happened was revenge against Christians. He accused the Interior Ministry of lying I suggesting the incident "is a mere quarrel," and warned them that no one will believe that the murderer is "mentally unstable," should they use this defense. Ghoraeel accused the police of seriously tampering with evidence, by insisting on the body being removed by ambulance. "Investigators came to a scene without a body, and then went to inspect the body in another place," he said. Many lawyers believe that this step was taken in order to reduce the judicial verdict down to manslaughter. According to Copts United Advocacy, Reverend Estephanos Azer, the priest at St. Serapium Church in neighboring Shebin el Kom, condemned the authorities and media fabrications when dealing with cases of Muslims killing Christians. He denied any financial dealings between the victim and his killer. "I hope that the authorities would respect our intelligence. The media treats us as a herd of sheep. We refuse that completely. We have logic and can think." He went on to voice what all Copts are saying that with every attack on Copts, the incident has to have one of two scenarios: either the killer is "mentally deranged," or the incident is due to a "material dispute." Taken the criticism the State Security received regarding their usual scenarios, they have now decided to take a completely different route, never used before. The pro-government newspaper "Youm 7" reported that Obdo Younan "Insulted Islam" and the killer therefore decided to take revenge by killing him. This news was picked up by other news agencies. Following this murder, Coptic shopkeepers in Bagour, Manufiya province, north-west of Cairo, are terrified to open their shops. "I am a watchmaker, How can I work when I feel that if I look down, someone might jump on me and behead me," a shopkeeper told Free Copts. George Abdo, son of the slain victim, believes that a radical Islamic organization is behind the incident. "For whose benefit is all this government misleading information?" he said, "we want justice nothing more." George said that by appeasing the radicals at the expense of the Copts, the government is giving them a green light to do as they please with the Copts. "Pressure on Copts will lead to explosion sooner or later. We are unable to live this way; we have nothing to loose," he warned. In an interview with Free Copts, lawyer activist Ashraf Ghobrial, one of the organizers of the Coptic National Strike on September 11, called on President Mubarak to personally intervene to ensure the safety of Coptic citizens. He said "I am saying there must be someone behind the killer. We ask the State Security to look for the terrorist cell behind him. If they don't, this incident will happen again and again, in different parts of the country. We want the State Security to protect us, all what they do is spy on us." No Muslim has ever been sentenced justly for killing a Copt. Consequently, the Egyptian Government's manipulation of facts is not to save the Copt's murderer from a just punishment, but more to save its face in front of the Western world for being blatantly unjust towards the Coptic victim, given that Egypt is a member of the UN Human Rights Council which is responsible for the protection of human rights around the globe.